Q: When are the four automatic emails sent out and what does the content look like by default? A: The four automatic emails that are sent are Membership Renewal Reminder email, Membership Expires Soon email, Membership Entered Grace Period email, and Membership Has Expired email. Membership Renewal Reminder Email: On the Renewal Notification Date the Membership Renewal Reminder Email will be sent. This notification is sent to Active members that will be billed an amount for their upcoming renewal. Renewal notification date is X number of days prior to the membership expiration date. Membership Expires Soon email: Three days before the expiration date, the Membership Expires Soon email is sent out. The email contains the expiration date, and a link to renew the membership on-line. 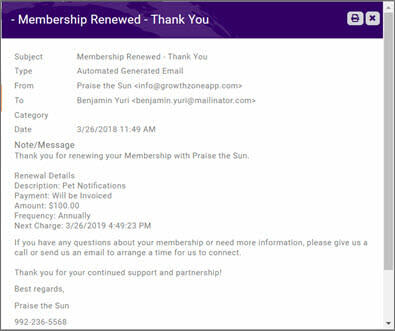 Membership Entered Grace Period email: If the Membership has Grace Period Days, the Membership Entered Grace Period email is sent the day after the Expiration Date. The email contains the expiration date, and a link to renew the membership on-line. NOTE: For membership that has the status of Courtesy, no renewal notification email is sent out. 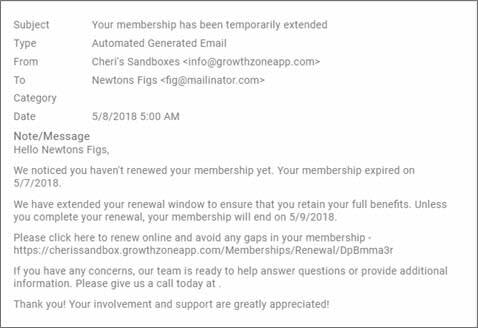 Membership Has Expired email: The day after the end of the Grace Period (or the day after Expiration if no Grace Period days are defined), the Membership Has Expired email is sent out. The email does not contain a link to renew on-line, it directs them to contact the association. NOTE: For membership that has the status of Courtesy, no renewal notification email is sent out. Q: When the member clicks the renewal link in the email, what do they see? A: The first three emails provide a link for the member to access a landing page where they will be able to renew (or not renew) their membership. Q: As a staff person, how do I access the public Renewal landing page? A: If a staff member needs to renew for the member, they may access the Public Renewal landing by impersonating the representative. Or by selecting Renew Membership in the drop-down Actions next to the Membership on the Contact's Profile. Q: What happens when the member selects to renew their membership? A: When the member selects the renew my membership option, they will be presented with the standard payment page where they are able to enter bank account or credit card information. As long as the member is renewing 31 days before the expiration date and does not have any remaining billings left on their existing membership, they can pay now. If not, they will be asked to setup automatic payment that will occur on the renewal date. Q: When payment is submitted during the renewal process, what are the scenarios that they may have presented? If there are no remaining scheduled billing items for this membership and today’s date is less than 31 days ahead of the membership expiration date, charge the card/account immediately. If there are no remaining scheduled billing items for this membership AND todays date is more than 31 days ahead of the membership expiration date OR if there are remaining scheduled billing items for the membership, the system will automatically set a scheduled billing for the frequency, starting on their renewal date against the selected profile. Q: What happens if my member chooses to renew but pay later (invoice me)? If there are no remaining scheduled billing items for this membership AND today's date is less than 31 days ahead of the membership Expiration date, the system will automatically create the invoice. If there are no remaining scheduled billing items for this membership AND today’s date is greater than 31 days ahead of the membership expiration date OR if there are remaining scheduled billing items for this membership, a scheduled billing item will be setup for the renewal and the invoice will be created at that time. After choosing the Renew my membership and pay later (invoice me) option, the invoice thank you screen will appear. NOTE: If a Stored Payment Profile is available for the member, the invoice me option will not be displayed. Q: What happens if my member declines their renewal by selecting 'no thank you'? A: If the member selects "No thank you. I will not be renewing my membership at this time." a drop-down list of public drop reasons will be displayed. The member may select a drop reason and add additional comments. After the member clicks submit, a new window appears to thank them for their reply. Thank you for letting us know that you will not be renewing. We are sorry to see you go! Hope to see you again soon! If you have questions or need more information, please give us a call or send us an email to arrange a time for us to connect. Thank you! In the back office, staff need not do anything. When the expiration date has passed, the membership will be automatically dropped, the drop reason and drop date entered. Note: Standard Drop reasons are now seeded in the database and the association can indicate which drop reasons they wish to display publicly. The standard drop reason Other requires the member to add additional comments. If only one drop reason is being displayed publicly no drop-down is visible. Q: What happens when a member renews? A: When a member renewal occurs online, an email is sent to the contact that is the owner of the membership (this is the same contact that the renewal notification is sent to). If the member has renewed by invoice “Will be Invoiced” is displayed as payment. If the member has paid by credit card, the last four digits of the credit card will be displayed as payment. This should be considered the receipt for the membership. Q: Can a member login and renew their membership in the Info Hub? A: Yes. A Renew Now icon will be displayed for members in the Hub (My Info -> Membership) that will open the renewal landing page that is specific to the logged in user and their membership. This will open to the landing page where the member is able to respond to renew or decline. Q: What do I see on the Contacts' Profile when the membership is renewed? 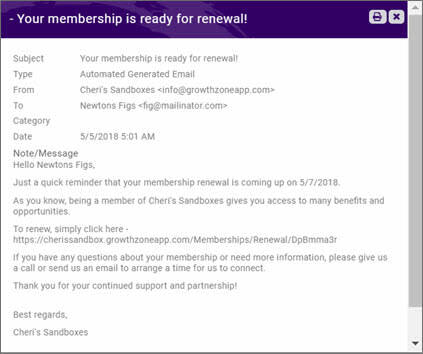 A: If the membership is renewed, the dates under the Membership are updated accordingly and a new entry called Renewal is visible in the Membership History. To see this information, click the Membership Name in the Memberships section on the Contacts' Profile. The Membership History will show an entry with Renewal in the Purchase Type column. Click the Membership Name in the Membership History section to see the updated Expiration Date, Grace Period Expiration Date, and Renewal Notification Date for the next membership. Q: What does staff see on a renewed members' Billing tab? A: On the Billing tab, in the Billing Fees and Schedule section, you will see an end date for the previous scheduled billing and a start date for the new scheduled billing. However, the billing will be crossed out because with this type of renewal, invoices are only created when the individual renews their membership - so not automatic invoicing actually occurs. Q: Where else can I view renewal activity? 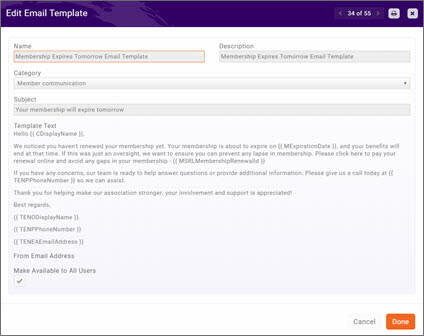 A: The Member Renewal will be displayed on the Activity tab for the organization, along with who renewed the membership. 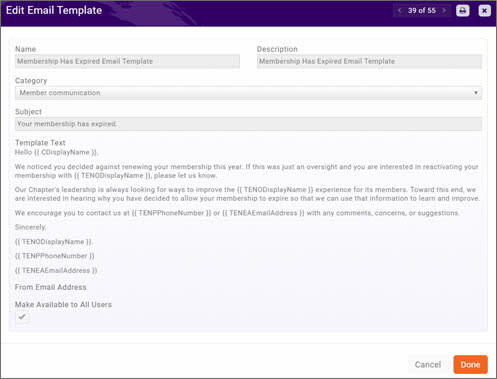 If the membership renewal was completed by someone online from the link within the email, the Contact Name will be displayed in the By column. Q: What happens after the Expiration Date is passed? A: The membership will remain in Active status until they are dropped after the grace period. The message “In Grace Period” will be displayed next to the membership on the Profile tab. Q: What happens after the Grace Period Expiration date is passed? A: The membership will be marked as dropped when the Grace Period expiration date has passed (one day after) and the member has not agreed to renew. The member is removed from directory listings, permission levels for contacts are set to the default level selected under Setup -> Login Settings. The open invoice associated with this membership will be written off. Q: What happens if a member has specifically declined their renewal? A: Members that have explicitly declined their renewal will display “Declined Membership” next to their membership on the Contacts Profile tab. When their Expiration Date is passed, their membership will immediately be dropped - no Grace Period will apply to them. Q: If someone indicates they want to renew and selects to be invoiced, then what do I do to make sure they actually get the invoice and pay for it? A: Just like any other invoice, you may wish to send them a copy of their open invoice which then provides them quick, easy access to pay for that invoice online. Q: Do you have a report that will tell me how my renewal eligible members are doing in their responses? A: Yes. The Membership Renewal Status report will show the current status of memberships and what stage they are in. Q: Do you have a way to view who is going to receive renewal notifications and on what dates? A: Yes. The Renewal Notification Emails Scheduled report will show a list of who, what email of the four types, and on which day they are scheduled to receive the notification. It also indicates the email address that is being sent to. To change this email address, modify the Membership Billing Contact, which is the first email address that the notifications attempt to send to. Q: What email address are the renewal notifications being sent to? A: Renewal notification emails will go out to this the default/primary email of this contact first and then will fall back to the next on in the list if the first is not available. To select the contact associated with these email addresses, edit the Membership on the Contacts' Profile. To change these email address, modify the contact's default/primary email address. Q: How can I see what emails are queued to go out? A: The Renewal Notification Emails Scheduled report will show a list of who, what email of the four types, and on which day they are scheduled to receive the notification. Q: How do I stop a renewal notification from going out? A: Edit the Renewal Notification date such that it is in the past. If you don’t want any emails to go to them, you would also need to extend the Expiration date out – otherwise the Expiring Soon and the Grace Period emails will still go out. Q: Which members can see the Renew icon in the Info Hub? A: To see anything about a membership, you need at least View access to the Memberships tab. Then you would need to be either the Billing or Primary Contact of the membership. If the membership is an organization membership, then the Primary Contact of the Organization will also have access. So in this case, as long as you can see the Memberships tab, you’ll be able to Renew if you have the proper role on the Membership itself. Q: How can I predict what my future revenue might be? A: Good question! Since invoices will only be created if they say ‘yes’ to renew, you will not be able to use Accounts Receivable as a place to look at for the possible income. Instead you will be able to use the Membership Report, filtered to the membership expiration date range you wish to forecast. (i.e. if you want to know the possible max revenue you would receive from June renewals, you would filter to expiration date June 1 – June 30.) Make sure to include the Membership Dues Total in the Fields to Display columns which will show the total that would be possible should all members in that range choose to renew. Another option is to gather predictions based on historical information. Running a Sales by Account report, summarized by Membership for the desired date range would give the historical numbers that you could multiple times your retention rate. Q: How does staff renew a membership? A: If renewal notice has been sent out, impersonate the individual and click Renew in the Hub or you can click Renew Membership in the Actions drop-down menu next to the membership name on the Contacts' Profile tab. Q: Is there a way to Renew someone in advanced of their Renewal Notification date? A: Yes but it would require enabling a feature that currently is only available by special permission. Contact support@growthzone.com to ask to have Renew Future Renewals enabled for you. This choice is then available to all staff, no matter their permission level.